I have just spent a whole day at the National Trust Property A La Ronde. The group was small; only four of us with a tutor from the University of Falmouth, Meredith Miller. 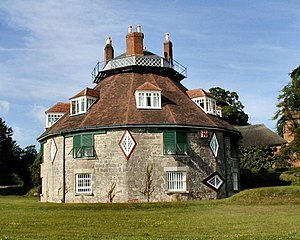 We were given a tour of this strange sixteen-sided house built by two sisters, the Parminters, in 1797. The rooms are strangely shaped and filled with objects collected by the sisters as they travelled around Europe. And of course the shells they collected and used to decorate their home. Meredith put the construction of the house in the context of events in the world of literature and politics and described the period as turbulent after the French Revolution of 1789. A La Ronde was for the Parminter sisters, the stillness in the storm. When we came to write, I wanted to build on that phrase and write about ‘being still.’ I had just finished reading The Last Runaway by Tracey Chevalier about a young Quaker. In the novel Chevalier describes the Quaker meetings and how still Honor Bright, her main character is during these services. I thought it would be a good exercise to write about stillness. I have called my character Sophia and I pictured her sitting in the drawingroom where I was sitting and I tried to imagine what it would have been like. ‘Sophia sat still, very still. On her lap was a collection of shells she had gathered that morning. The clock ticked the seconds away. She heard the click of her mother’s knitting needles, the rustle of paper as her sister turned the pages of a novel. Then the clock chimed, one, two, three … up to eight.